Our work “Non-covalent hitchhiking on endogenous carriers as a protraction mechanism for antiviral macromolecular prodrugs” has been published in the Journal of Controlled Release. Albumin is a highly successful tool of drug delivery providing drastically extended body and blood residence time for the associated cargo, but it only traffics single drug copies at a time. In turn, macromolecular prodrugs (MP) are advantaged in carrying a high drug payload but offering only a modest extension of residence time to the conjugated drugs. In this work, we engineer MP to contain terminal groups that bind to albumin via non-covalent association and reveal that this facile measure affords a significant protraction for the associated polymers. This methodology is applied to MP of acyclovir, a successful drug against herpes simplex virus infection but with poor pharmacokinetics. Resulting albumin-affine MP were efficacious agents against herpes simplex virus type 2 (HSV-2) both in vitro and in vivo. In the latter case, sub-cutaneous administration of MP resulted in local (vaginal) antiviral effects and a systemic protection. 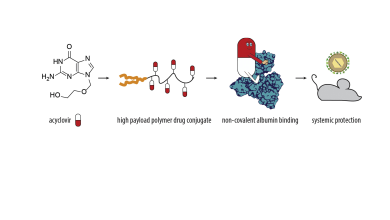 Presented benefits of non-covalent association with albumin are readily transferrable to a wide variety of MP in development for drug delivery as anticancer, anti-inflammatory, and anti-viral measures.